Over the last few decades, people with tattoos seem to have gotten a bit of a bad reputation. Some people see a heavily tattooed guy and immediately think that he had gone to prison for some bad choices that he made in his life. They see a girl covered in tattoos walking towards them and they stop and stare like she was some kind of cult activist. In a world where ideas like inequality and discrimination are strongly and constantly being fought against, somehow people with tattoos still seem to get the raw end of the deal. Fortunately, today's society is slowly starting to open up and become more accepting of the truth that not all people with tattoos are bad. Movies, television, and social media have all played a role in changing the way the world looks at people who have decided to express their individuality through body modification. More people are starting to see that having tattoos is actually an attractive quality, and rightly so. Here are a few reasons why you should consider dating a person with tattoos. 1. People with tattoos are passionate. When you feel so strongly about something that nothing other people can say could ever make you think differently, that's called passion. 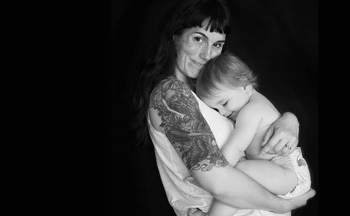 People with tattoos often feel strongly about certain ideas that talking about them isn't enough; they need to have those ideas embedded into their skin as an expression of their ideas, beliefs, and experiences. A tattoo is an expression that will almost certainly never come off. 2. People with tattoos are committed. Speaking of things that never come off, tattoos are, for all intents and purposes, permanent. Sure, you can get laser treatment to "erase" your tattoos, but doing so will burn your skin, and the process usually leaves a scar. Getting your tattoos removed costs a fortune, and laser treatment is said to be even more painful than getting a tattoo in the first place. Anybody who is still willing to get some ink done after knowing all of that definitely knows a thing or two about commitment. 3. People with tattoos are rarely boring. Every tattoo has a story behind it. They could be a reminder of times gone by, a representation of their dreams and ambitions, or a lasting symbol of respect for the people in their lives. The meaning behind a person's tattoos is always a good conversation starter. Whether you like tattoos or not, dating a person with tattoos is anything but boring. Also, because of the social stigma that comes with getting inked, a person that has tattoos tends to be a bit of a risk taker. And taking a few risks every now and then always adds excitement to any relationship. 4. People with tattoos are open-minded. People who break away from societal pressure and decide to go ahead and get inked despite the seemingly bad reputation must have an open mind. They see something in the art of tattooing that other people simply aren't willing to explore. And because open-minded people are also good listeners, communication hardly becomes a problem. 5. People with tattoos are generally more confident. A person with tattoos usually wears his or her ink with pride. Unless they got inked after a wild night of drinks, or they lost a bet, or had their poorly executed tattoo done by rank amateur who smoked a little something too much, people are usually more than happy to show off their tattoos. People with tattoos seem to be more confident and have higher self-esteem. Ask anybody and they will tell you that confidence - not arrogance - is always an attractive quality. 6. 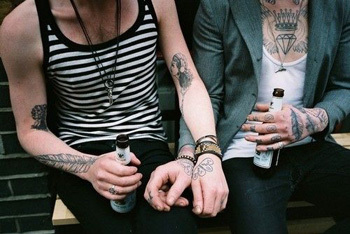 People with tattoos are more expressive and easier to get along with. A tattoo can also be seen as a message to the world, and wearing one proudly shows that you are not afraid to express your personality. Whereas historically, tattoos were used to identify rank or position in a tribe or community, their messages have now become more personal. People who are not afraid to of this level of self-disclosure also enjoy a kind of freedom that allows them to become more open and unguarded, making them easier to get along with. And being with someone you get along with is important in any relationship. 7. People with tattoos tend to be artistic. A person's tattoo is also an artistic expression. Its design and placement shows the person's interests and taste in art. Look around you and will notice that a lot of artists and musicians today have tattoos. Of course, just because a man has a tattoo doesn't automatically mean that he is an artist, but you can bet that he knows how to appreciate art. The same goes for women who have tattoos. They know what real beauty looks like. 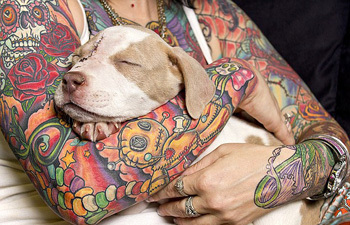 People with tattoos are creative, and at some level, they also make for great partners. 8. People with tattoos know how to deal with pain. Okay, so getting stabbed repeatedly by needles isn't exactly the relationship kind of pain, but getting a tattoo takes courage nonetheless. And when it comes to dating, courage can be difference between walking up to a person to start a conversation and sitting alone at the bar. If a person can stand up to the pain of getting inked, that's still more pain than what other people can take. People with tattoos know what they are getting into, and a relationship is less likely to scare them away. Whatever your opinion is when it comes to body modification, whether you're into them or not, people with tattoos are always interesting to be with. Don't be too quick to turn a person down just because you saw his or her tattoos. Strike up a conversation, and you might be surprised to see just how much the two of you might have in common. So live in the moment. Take chances. Who knows? Asking about that rose tattoo could just be the start of something wonderful.